Plates are marked by stamping and with paint. In the case of cold stamping of plates (four-high), the plates are stamped using the low-stress spot method. In the case of manual stamping (two-high), it is necessary to agree on the low-stress method in the order. 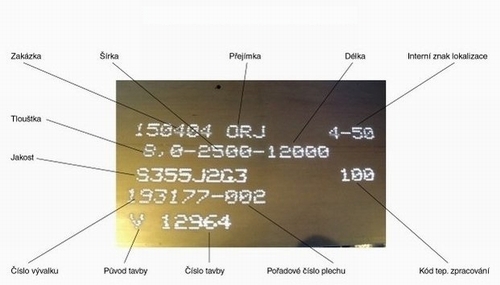 The plates are marked with white paint on automatic signing machines or manually (usually using templates). 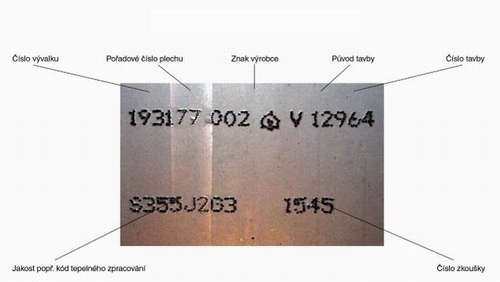 A specific requirement of a customer for marking of plates with text (spraying white paint on plate) or colour marking is implemented after agreement as part of each individual order. The Colour Marking Catalogue containing the individual patterns is available to make the choice of colour marking easier.